In WMSPanel statistics are collected and accessed via data slices. It's a point of view at the data collected by all customer servers. They may be applications-based or streams-based. Our pricing is also based on slices - just because we need to pay for data processing and storage. While data slice provides full variety of reporting, many customers want to get just a very basic statistics. Like, they don't need streams real-time reports, they just need daily statistics with geo and duration details. So we came to the option that would allow to reduce the reporting functionality of data slices in exchange to reduction of the price. We call this option a "lite slice". Let's see what is the difference. If you go to "Streams report" for the full slice you can see the list of active streams which currently have connections. Each name is the link to the stream dashboard where you can see real-time chart with connections, bandwidth and top-20 countries of visitors, as well as retrospective charts for last 24 hours. For lite slice, there will be no link to the page and no stream dashboard page itself. Just list of streams with number of current connections. Lite slices are targeted for those small clients of our customers who check their simple stats on a periodical basis and don't need complicated workflow. That's why this kind of slices should be seen by just 1 user besides admin users. Since lite slice has not streams data, the Deep stats are also not available for this slice type, sorry. 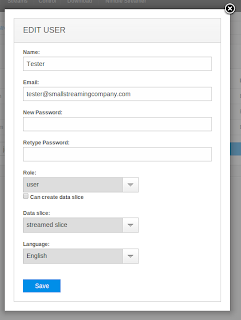 When account is created, a default Full data slice is created to collect all incoming data. You cannot convert it to lite slice due to that reason. So whatever custom slices you create, you can convert them between lite and full while default slice remains full. The limitations mentioned above are the only ones applicable for lite slices. All other reports and capabilities, including white label, billing or streams control, are used the same way as for full slices. Stream-based slice is the best case for using this limitation because there an admin may set the streams name and so real-time chart for a slice will be the same as real-time chart for the stream. Application-based slices are also fine being lite, of course. Reduced functionality allows reducing the price. It's cut by half. and it starts from 10 USD per month and goes down as you create more slices. You may combine full and lite slices. For example you may have 1 default slice (which is full and cannot be reduced) and 5 lite slices. This would cost 55 USD per month. If you'd like Wowza geo-location stats enabled this would mean additional 18 USD per month. One more example. 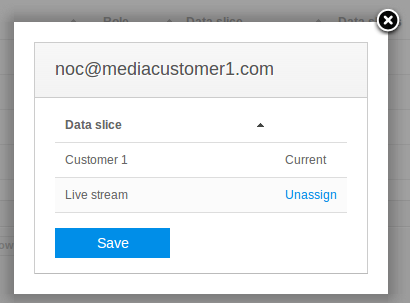 You have 1 full data slice by default and want to track 3 camera streams which are shown to your customers. You don't need geo-location statistics, just basic stats. You create 3 lite stream slices. According to prices table is would be 17 + 9*3 = 44 USD per month. Another example: you have 3 full slices and 18 lite slices with geo-location stats. Looking at price list you see "20-29" column with the cost of full slice as 13 USD and lite slice as 7 USD. Geo stats option costs 2 USD per slice per month. Click on Manage link in top menu for slices. In the new dialog box, un-check the "Show streams real-time and retrospective reports" check-box. For new slice, this would be the same - just use the same check box. If you want to switch back from lite slice to full slice then check the "Show streams real-time and retrospective reports" check-box and click the "Save" button. Before your next billing period starts, our team representative will contact you regarding subscription price changes. Protection and restriction against the un-authorized access to the media is crucial for streaming business. WMSPanel team originally started its path by creating WMSAuth hotlink protection for Windows Media. 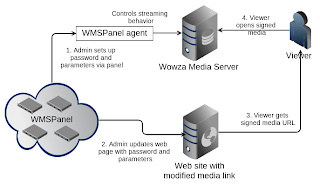 Later on when we switched to Wowza Media Server, one of the first things we did there was WMSAuth hotlink protection. BTW, you can read a brief history of our solution in Dan Rayburn's blog post. Now about 1/3 of our subscribed customers use WMSAuth hot-linking protection or connections limitation capabilities. 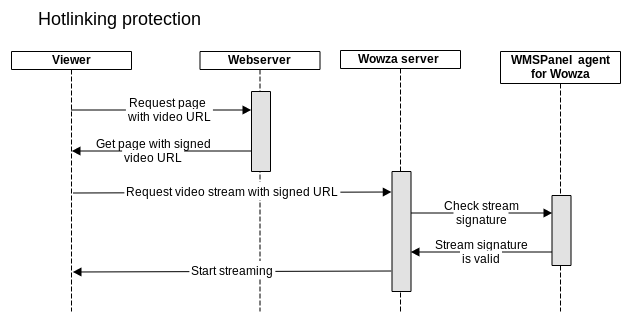 Hot-linking re-streaming protection has simple yet powerful architecture. A customer signs up links to available media with a hash and WMSPanel agent checks the signature when a viewer tries to connect. One interesting use case which obviously follows from described links protection is that the link may be presented via designated domains and websites only. Here's how it works if a regular user tries to play media and if some grabber tries to do the same. Customer changes his media web pages which show video. Each video has a hash signature which is based on several parameters, including IP and secret password known to a customer only. If an authorized user opens a page, the link gets signed with signature where his IP is hashed among other parameters. 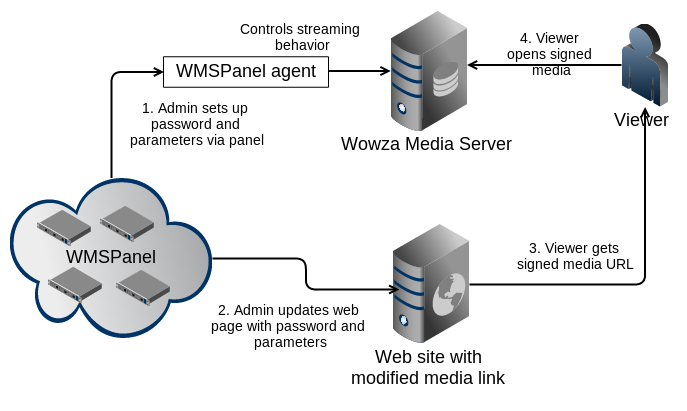 When the viewer connects to media, the WMSPanel agent checks the hash considering user IP and allows connection. If the some grabber opens the page, the grabber's IP is used to access so the media is signed respectively. When the grabbed page is shown somewhere else, the unauthorized viewer tries to open it with his own IP - the new IP which is not hashed in the media signature. The agent checks new IP with IP from the signature and denies connection. Here's the flow chart for this scenario. Hotlinking protection with WMSPanel Wowza agent. This functionality is more reliable than domain lock solutions which are based on Referrer header check. An abuser may easily fake any headers and get these streams while WMSAuth simply cannot be faked at all. User IP might not be enough for this kind of media protection just because some users may watch the media from behind the proxy or firewall. In this case you can go beyond that and use pay-per-view framework for Wowza. It uses the same principle but it embeds user unique ID into the signature instead of an IP. It also brings wide variety of possibilities for building your own paywall. To try these hotlink protection mechanics you can sign up for free trial and use it free of charge during first 2 weeks. Notice that hotlinkng protection is available for Nimble Streamer. With Nimble, you can make unique signature for each individual stream. 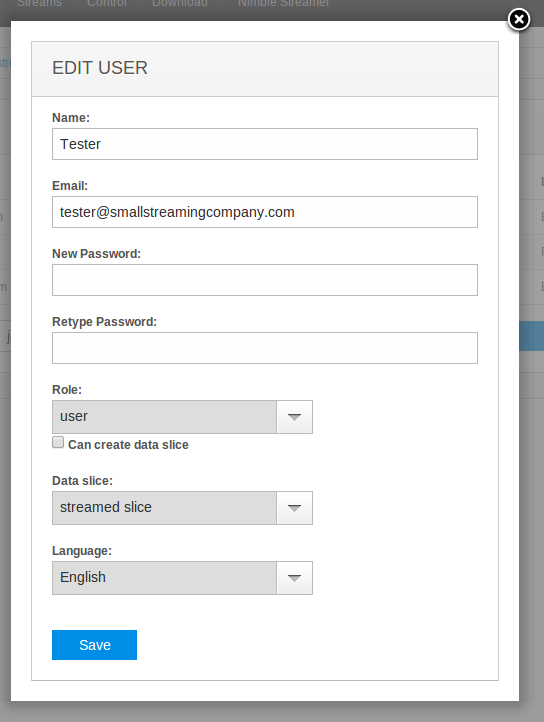 Nimble Streamer is the light-weight HTTP streaming server for HLS, Smooth and progressive download. 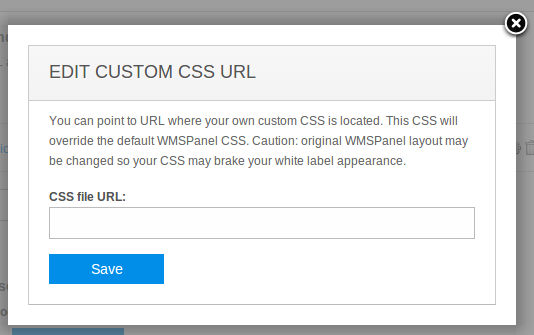 WMSPanel is an official GUI for Nimble Streamer. Working on Nimble Streamer and also on support of HLS statistics for Wowza, our team is continuously making researches regarding HLS, MPEG2TS, MPEG4. As a result we have several tools that help us building great solutions. Today we've made an update for the mpeg2ts analysis tool. It analyses HLS *.ts files and gets containing streams' info. You can find some examples in this Wiki page. Now we've added more info info the output, like Adaptation field info. It is also now able to get and save PES packets info. This info includes all PES packets for all streams of current transport stream. BTW, during the analysis we found that when ffmpeg tool makes MP4 to HLS transmuxing, it adds too many PAT and PMT tables into *.ts chunks. This doesn't comply with Apple recommendations and makes about 8% additional traffic overhead. To compare, Wowza follows Apple's comments and makes perfect *.ts chunks. You can use mpeg2ts analysis tool and make your own comparisons. This tool is part of our open source contribution, check our github repositories for more code.